Analysis in CanOils’ new report “Upstream M&A Value in Canada Rebounds in September 2015” shows that September was the biggest month for Canadian M&A activity since May, if the three deals announced in 2015 with a value of over Cdn$1 billion are excluded. 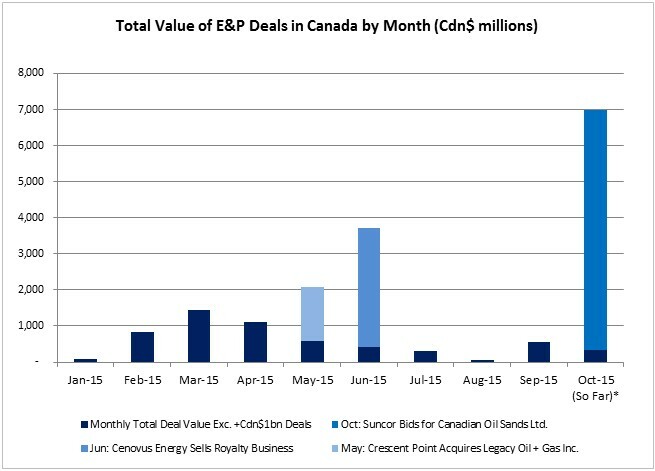 The Canadian oil and gas sector had Cdn$563 million of upstream M&A deals announced during September 2015. It marks a steep improvement on the approximate Cdn$59 million of deals that were witnessed during August 2015. The low value of August 2015 was also the lowest monthly total in at least the past 8 years, as the double dip in oil price experienced that month, allied with an already deflated gas price, led to a tentative industry. October has started with a bang as Suncor Energy bid Cdn$6.6 billion for Canadian Oil Sands Limited. The new report is the first of CanOils’ new monthly reviews of Canada’s M&A industry, in which all the month’s major deals, deal stories and assets for sale will be looked at in depth using data from all of CanOils’ databases, including CanOils Assets. Source: CanOils M&A Database. *Note: October deal value correct as of Friday October 9, 2015. Deals allocated according to the month they were announced, rather than completed. 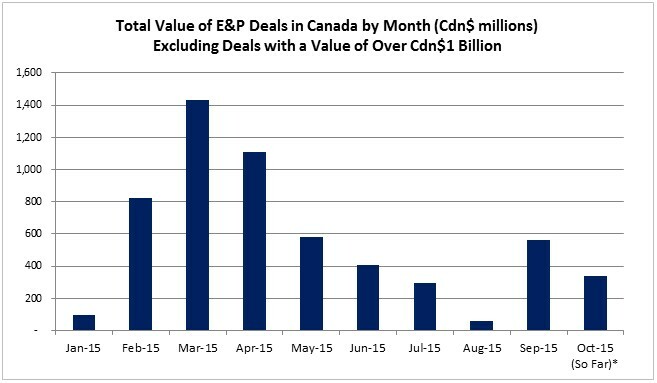 Of course, the above chart is dominated by the deals/potential deals of over Cdn$1 billion. In May, Crescent Point Energy Corp. announced the acquisition of Legacy Oil + Gas Inc., in June, Cenovus Energy Inc. announced that the Ontario Teachers’ Pension Plan was acquiring its royalty business and then in early October, Suncor Energy made a $6.6 billion bid for its Syncrude partner Canadian Oil Sands Limited. If we exclude these three deals, the increase in activity in September is easier to see. In fact, activity aside from major deals picked up to its highest level in terms of overall value since May. 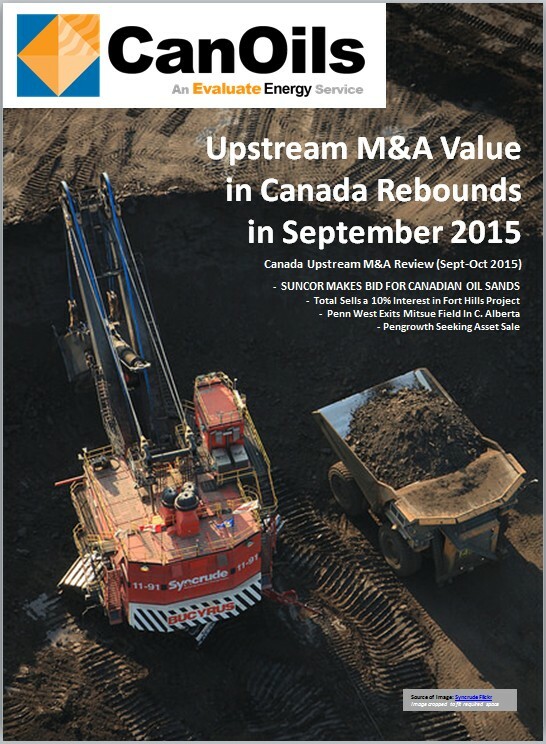 Suncor Energy is a huge part of the upturn in deal value in recent weeks and is undoubtedly the major focus of this month’s report “Upstream M&A Value in Canada Rebounds in September 2015”. Not only did it make an offer for Canadian Oil Sands in what could prove to eventually be Canada’s biggest deal of 2015 should it ever complete, it also increased its ownership in the Fort Hills mine project in a Cdn$310.0 million deal for an extra 10% interest from Total. Both deals, along with Canadian Oil Sands’ immediate response to Suncor’s offer, are analysed in detail in this month’s report. A round up of all the deal stories impacting Canada’s oil and gas industry in September and the very start of October. 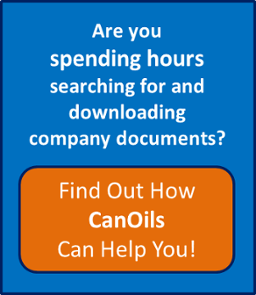 Insights from CanOils’ M&A database, as well as data from CanOils’ Assets, Financings, Financial & Operating and Oilsands databases, help to provide a thorough, independent overview of the month’s biggest deals in the Canadian oil and gas industry in this report. Image cover is sourced from Syncrude’s Flickr account and cropped to fit the required space.